Steadily increasing noise pollution is a feature of our modern world, and various efforts are made to use acoustic measures to reduce noise levels, for example at airports, railway stations, in public buildings and offices. Acoustic nonwovens in ceiling constructions, wall linings, room dividers or office furniture are an effective means of reducing noise. 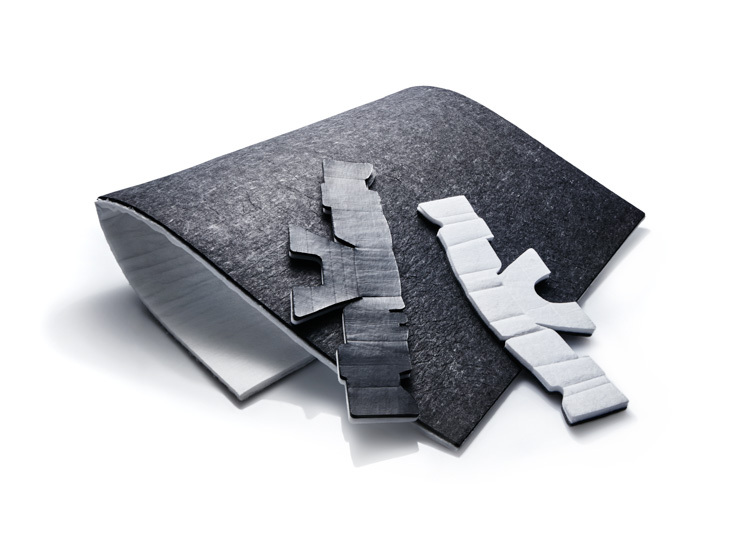 Effectively used acoustic nonwovens enable noise levels to be reduced by at least 10 dB. However, the effectiveness of any acoustics measure cannot be guaranteed by the quality of the acoustic nonwoven alone. Other factors play an important role as well. The void depth measures the distance between room ceiling and ceiling construction. The perforation size indicates the diameter of the openings in the ceiling board. The open area specifies the percentage of “holes” in the ceiling. Consequently, there is no such thing as an acoustic nonwoven that achieves consistently high absorption values in varying conditions (even if this is sometime claimed). 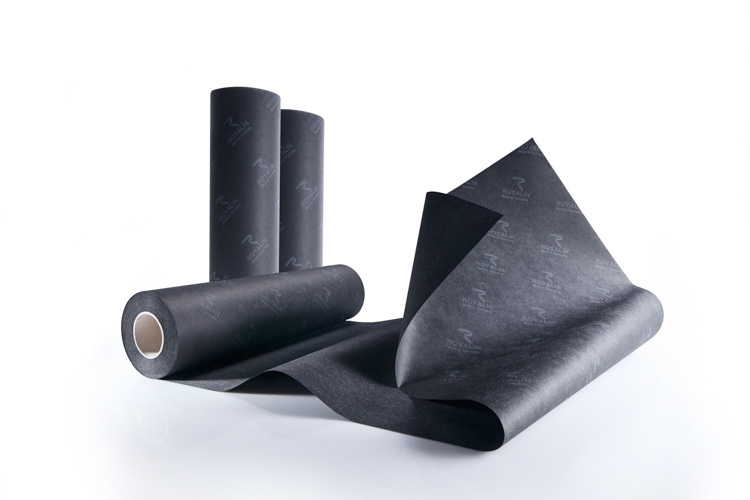 However, the acoustic nonwoven fabric can be adjusted in terms of air permeability and flow resistance so as to allow the best possible acoustical absorption for a given application. We are recognised experts in this area - find out for yourself. Noise spreads in the form of acoustic waves. If these waves are absorbed, the noise level decreases. If the waves are reflected, the noise level increases. In terms of physics, acoustic absorption is the reduction of acoustic energy by converting it into thermal energy. The more effective the measures taken, the more “pleasant” the room acoustics become. To measure the effectiveness of noise reduction, the so-called sound absorption coefficient α is used. This value indicates the ratio of absorbed to reflected energy. An α value of 1 means complete absorption. An α value of 0, however, stands for complete reflection of the acoustic waves. The sound absorption is measured over a frequency range of 125 - 4,000 Hz. However, the absorption levels are not the same for all frequencies. Hence the α value is the “statistical mean” of all values measured. Acoustic nonwovens are an effective means of absorbing sound. An α value of up to 0.8 can be achieved, which means a noise level reduction of at least 10 dB. Acoustic nonwovens are mainly used in ceiling constructions, but also in wall linings, room dividers and office furniture. We are one of the leading specialists for acoustic nonwovens. Find out for yourself about our expertise in this area. Composites consist of two or more different materials. In producing composites, we endeavour to combine the crucial properties of the individual components into a single product with enhanced properties. 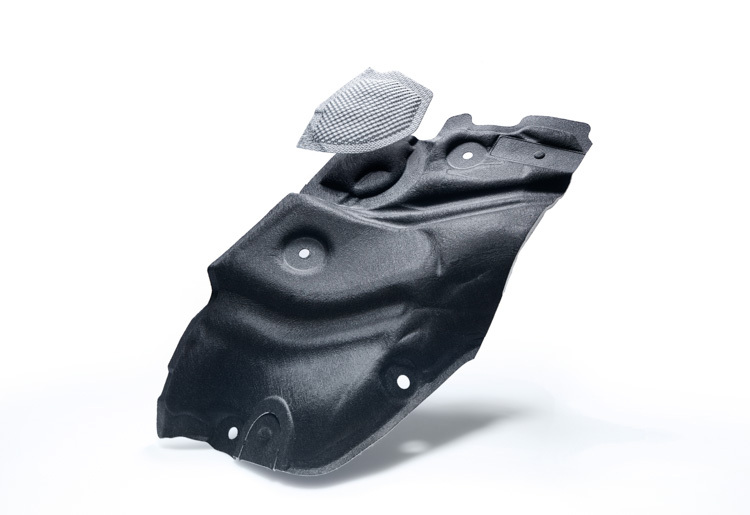 Example: fibre-reinforced plastics - increased stability combined with a reduction in weight. Wind generators, for example, would hardly have come into existence without such composites. Royalin produces laminated composites or laminates that consist of up to 6 components. Currently we mainly use nonwoven and woven fabrics, mats and various films in our production. Bonding of the individual materials is achieved with an adhesive agent. This is the challenge we have set ourselves. We produce layered composites or laminates made of up to 6 components! Today, nonwovens are found in various car parts. More than 80 applications are known, and one single car can contain well over 20m² of nonwoven fabrics - and the figure is on the increase. You would not recognise the majority of these fabrics as nonwovens at first sight. The requirements for the nonwovens are as varied as the applications. The fabrics must be oil and water resistant, flame-resistant, temperature and dimensionally stable, just to name a few of them. Nonwovens offer a wider range of functions when processed, among others with regard to their mouldability. The price/performance ratio is much better, partly because they offer lower material weight with the same or better properties. Recyclability of nonwovens is often better. 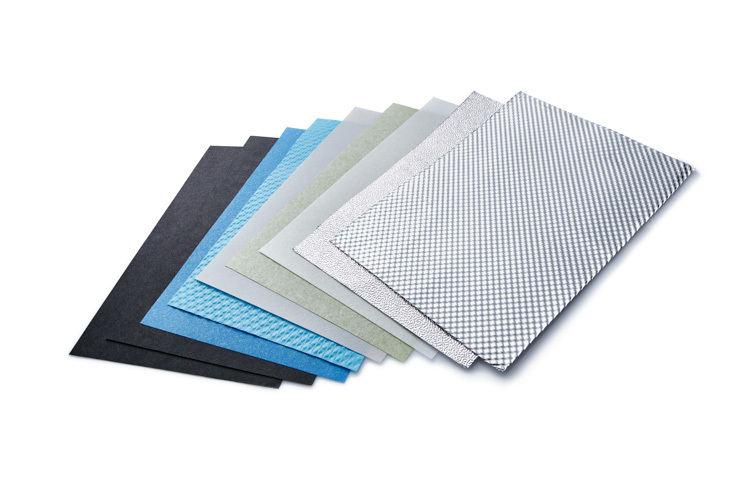 Nonwoven fabric is the cutting-edge material for cabin filters. With regard to “classic” automotive filter applications such as air, fuel and oil filters, nonwovens still have some way to go. For the time being, impregnated special papers are mainly used for this purpose. 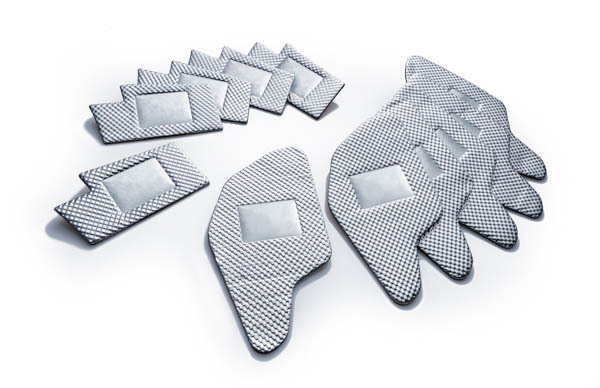 The situation with cabin filters, however, is completely different: Since the late 1980s, nonwovens have been the material of choice for this application. Today, nearly all cars are equipped with nonwovens. Originally conceived as mere particle filters, a combination of nonwoven and activated carbon was soon developed that made it possible to eliminate gaseous pollutants, too. 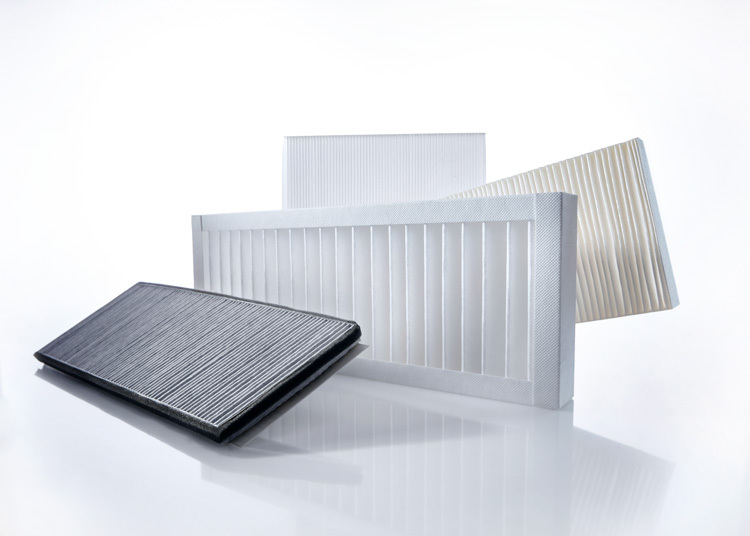 Today, “modern” cabin filters basically consist of an absorbing layer of activated carbon and a three-dimensional liner made of highly permeable (PET) nonwoven with an electrostatically active meltblown (PP) support layer. 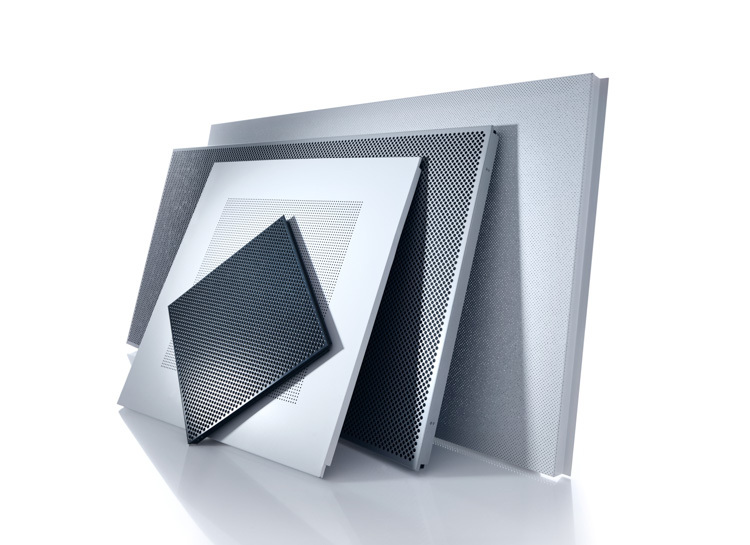 Acoustic and thermal insulation is provided by embossed and perforated aluminium films. These are pressed into composites, e.g. for lining the bonnet or front bulkhead. Glass nonwoven used as intermediate layer ensures the necessary dimensional stability to maintain the accuracy of fit of the parts in a temperature range from -40° to at least +130°C. Filtering gaseous and liquid media is a broad field, with more than 1,000 known applications, so numerous and complex requirements have to be met by the media and materials used. Nonwovens are particularly suitable as filter media, as they offer a very large variety of fibrous raw materials, fibre lengths, fibre diameters (fibre fineness) and fibre cross-sections. They can be precisely “fine-tuned” to individual requirements in terms of mechanical stability, air permeability or pore size distribution. The numerous finishing possibilities are another advantage. Nonwovens can meet requirements such as oil and water resistance, flame resistance, antibacterial or antistatic properties, to name just a few. Most of the time, several factors are important in selecting a suitable medium and they frequently even contradict each other. For example improved filtration efficiency results in a higher pressure difference and consequently shorter service life. Air filters are mainly used in the form of filter cells, cartridges and bag filters. In the case of filter cells and cartridges, the medium is folded. Royalin’s nonwoven fabrics are particularly suitable for this purpose. The filtration of particles from gaseous elements can be divided into the following fields: ambient air, process air conditioning and dust removal. Two different methods are used in this respect. In the case of surface filtration, the particles are first separated on the medium’s surface. In the course of the filtration cycle, a dust cake forms until the air stream through the medium is blocked. The filter is then cleaned and can be used several times. In the case of deep bed filtration, three-dimensional, dynamically designed nonwovens are used. The particles are collected in the fibre layer until the capacity limit has been reached. Deep bed filters cannot be cleaned and must be disposed of following one-off use. The choice of filter method depends on various parameters such as dust concentration, particle size, airstream velocity and pressure difference. The filter media classification is based on different standards and test procedures. The most common standard is EN 779:2013 with the following classification: Filter classes G1 - G4 for coarse dust filters and filter classes M5 + M6 and F7-F9 for fine dust filters. The EN 1822:2009 standard classifies so-called Hepa and Ulpa filters. There are numerous liquids and suspensions that need to be filtered. They range from pharmaceuticals to sewage sludge and therefore involve a wide range of different requirements and media. Liquid filtration can be divided into two categories: Sewage filtration and cake filtration. In the case of sewage filtration, the concentration of suspended solids is relatively low and there is a high flow velocity. Drinking water filtration is the most common example here. If the solids concentration is very high, so-called cake filtration is performed. The filtration of cleaning baths in metal processing is a good example in this context. For both categories, surface and deep bed filtration are possible. Nonwovens are particularly suitable for liquid filtration because their mechanical, chemical and thermal properties can be widely adapted to the particular requirements. Nonwovens are mainly used as band filters, filter bags and in the form of cartridges and candle filters. Jedes Cookie, wie z.B. Google Analytics Cookies.